I wanted to add a second Lycan Horde to The Herd. 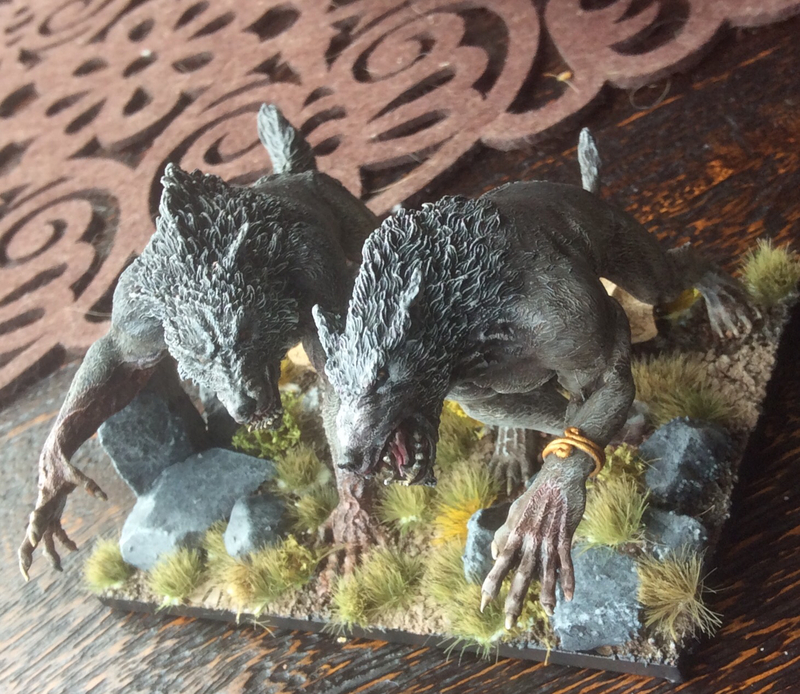 Luckily Mierce's recent sale of Monsters allowed me to pick up two Werewolf models. 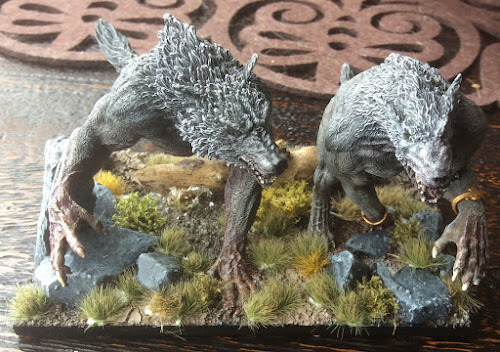 Both of these are mid size range and stand about 70mm at the shoulder when on all fours. 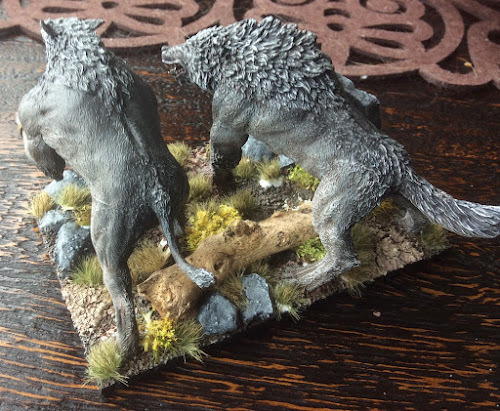 Both models are quite feral which fits well with The Herd. 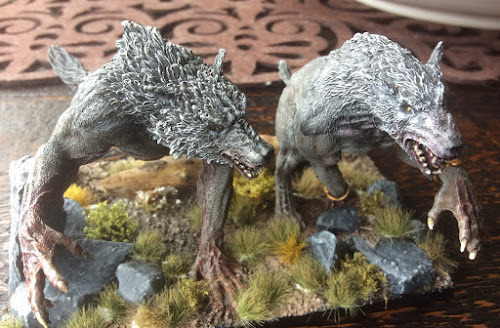 The front "paws" are very human hand-like while the rest is all wolf. You can see that the two models fill the 120mm x 80mm base pretty much fully so I'm hoping that the "rule of cool" gets you past MMC. Obviously these are Large Infantry, so Height 2. The models are probably a little big for Height 2 but I'll make sure opponents are aware of their gaming size. The base is mdf from Sarissa Precision with magnetic sheeting on the bottom. I've used gravel as the rocks and a twig from the garden as fallen log. 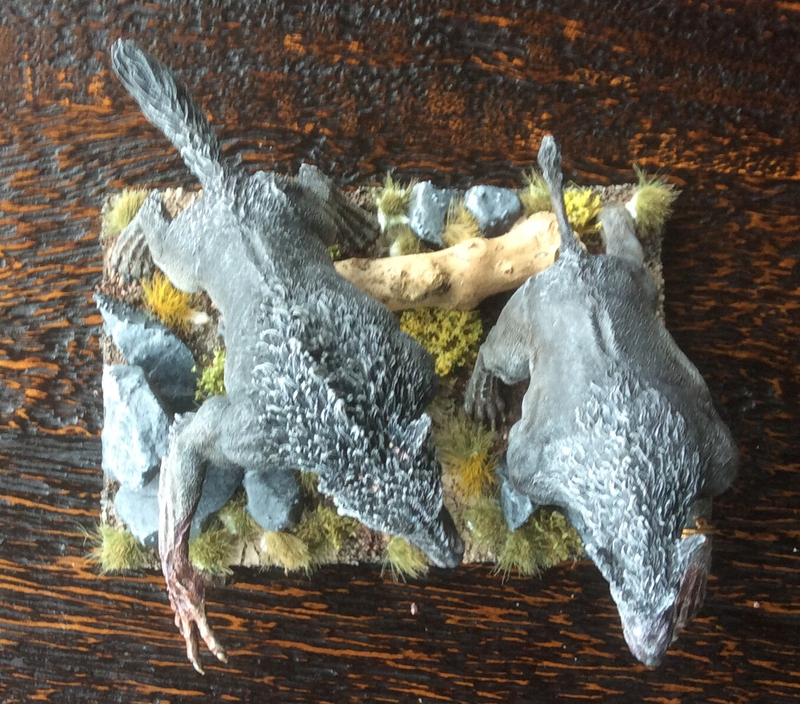 The sand has been PVA'd onto the mdf and then I have used some GW Aggrallen Earth to get the dried mud. Finally I have used a mix of tufts to filled out the base to represent broken ground. I want to add some leaves as ground cover and will do that once the tufts are fixed. Here's the General's eye view of the unit. Happy with how they turned out and expecting big things on the table. Daaaaamn. They turned out well. I can't see anyone having a problem re MMC personally given how well presented they are. Those are bloody great. 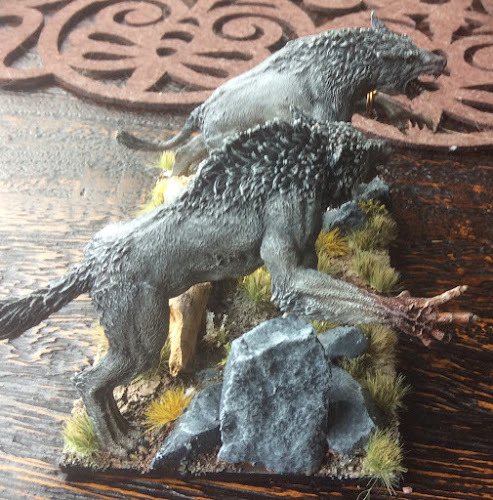 Shame they're not a bit smaller so you could fit three or four on a base, which I think would look better, but fantastic models and great painting/basing anyway.